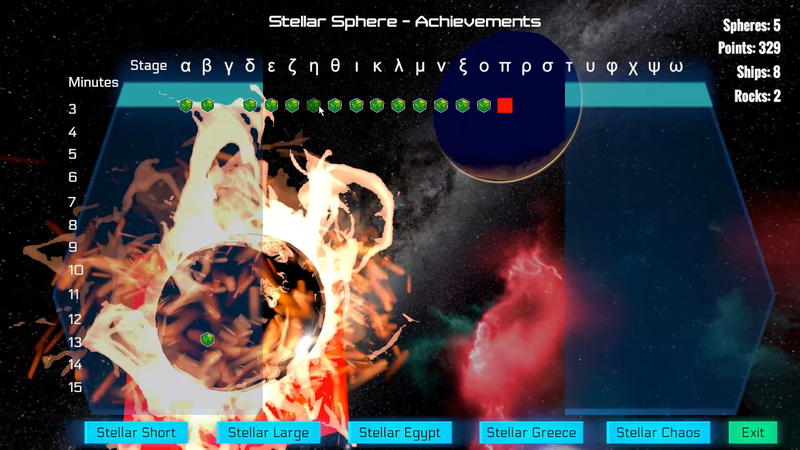 Stellar Sphere is almost ready to be released, and we are working hard to polish the game completely. We're confident from day one the game will bring a lot of action to the players. But of course we'll be adding new features in the future, including two new scenarios for free with a maximum time of two months after release. But now let's concentrate on the work we're doing now, and the video we have recorded. This video shows a complete level with the minimum time available: 3 minutes. A fresh video with a complete level with no cuts and no tricks. In this new post we are going to go straight to the point, with a video of a live session of the shortest time that can be configured, which is 3 minutes. Remember that the maximum time per level is 15 minutes. Remember also that the levels are 24, and that the name of each of them is the name of the letters of the Greek alphabet. So don't panic when you see "Alpha level". It's not an alpha of the game, but the first level. Why name the levels with greek letters? Because it's cool. Well, that's one reason. There are more. Some betatesters have asked why we have chosen Greek letters. The reason is very simple: because they are part of our culture, and we think it could be original. There are probably other games out there that have done something similar, but in any case we chose the Greek letters instead of numbers, and we think the result is worth it. Just to review, let's remember that the game consists of getting the most points and scores in the wormholes. Catch the sphere, look for the active wormhole, and throw to score. And survive in the meantime of course. The balance between scores and survival is critical. You must end the level. If you die 1 second before ending the level, you lose everything. The configuration screen can make the game change radically. 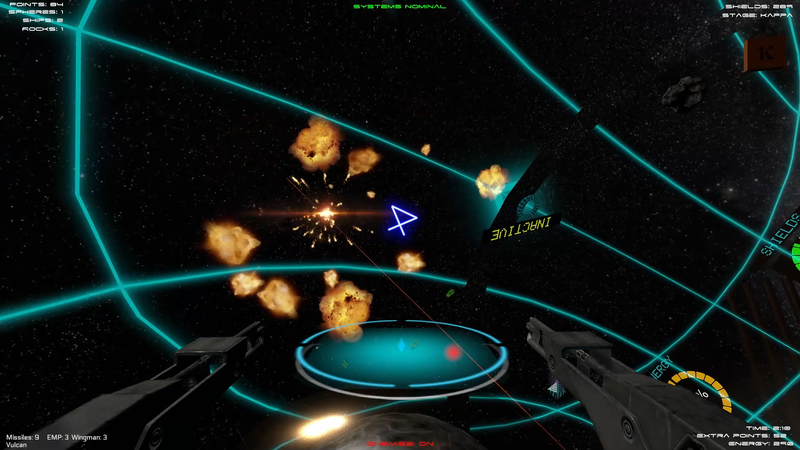 Enabling or disabling the guide pointer at the top, which indicates where the sphere is and then the wormhole to mark, makes the game very different. Try it when you play, we assure you that you will notice it. Remember that the physics of the game can be changed. The ship's physics, making its friction greater or lesser. That of the sphere, with the same result. And gravity, which is zero by default, but can be activated. Playing with or without gravity modifies the game in a very important way. Again, try the options, and keep the one you like best. Do you really want to suffer? Activate the negative scores. One minute, two, or three. When that time passes, if you have not marked, the system will deduct a previous marking. And the worst: if it was zero, it will be negative. You can end a game with a worse mark than you had at the beginning. It's optional, activate it if you want a bigger challenge. Remember that spheres with plasma lines are anti-gravitational. If you throw and there is a fence, negative gravity will displace the sphere. And that frustrates a lot, we can assure you. But that's what it's all about: suffering. Online mode? This is a question made by betatesters. Yes, when we can release it. One team, A, scores and defends, while the other team, B, attacks. When the level finishes, roles change. Now team A attacks, and Team B defends and scores. This gives an incredible field of opportunities to enjoy the game. But we'll talk about it in the future. What to seen in the video. This video is a complete level, Kappa, in normal difficulty, with the minimum time available per level, 3 minutes, and recorded so the player can see many of the elements of the game. Not everything of course, but the whole idea. The game was fast, but betatesters asked for more. Remember, in any case, that the configuration menu allows to change speed and other elements. This video has been recorded with almost everything in "default" mode. But we know players want to personalize games, and we have added different options to do it. The blog gives more information in detail, but many of the elements are self-explained. For more information and details about Stellar Sphere we recommend the previous articles we have published here, which detail, with text and video, many of the elements of Stellar Sphere. Thank you!